SAN FRANCISCO (AP) -- Samsung unveiled a highly anticipated smartphone with a foldable screen in an attempt to break the innovation funk that has beset the smartphone market. But it's far from clear that consumers will embrace a device that retails for almost $2,000, or that it will provide the creative catalyst the smartphone market needs. "Get ready for the dawn of a new era," declared DJ Koh, who oversees Samsung's smartphone division. The new phone, he said, "answers skeptics who said everything has already been done." But most analysts see a limited market for foldable-screen phones, at least in the early going. 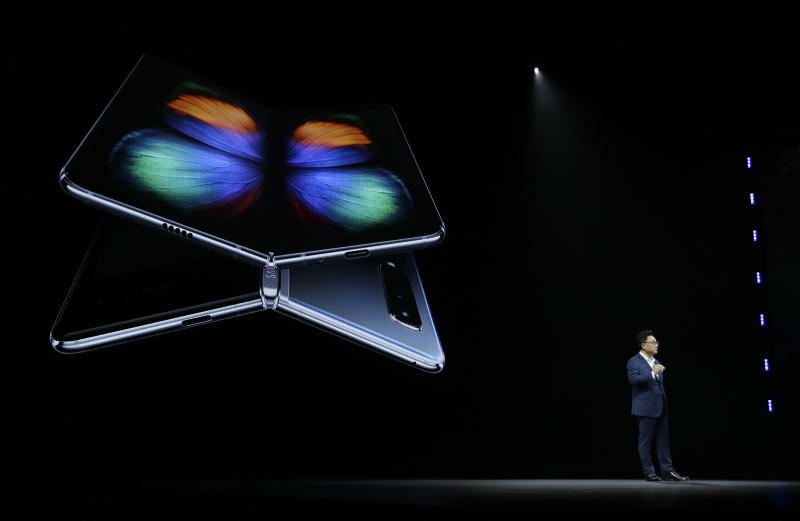 Phones like the Galaxy Fold "are likely to sell to a very limited market of technology aficionados who like big screens and have big wallets," said IDC analyst Ramon Llamas. Although he also believes the Galaxy Fold is more a "status symbol" than mainstream product, Moor Insights & Strategy analyst Patrick Moorhead said the device is symbolically important for Samsung, the top seller of smartphones in the world. "The Fold was icing on the cake showing that Samsung is the company driving new innovations and excitement to the market," Moorhead said. There's no doubt that the Galaxy Fold is "luxury technology," conceded Justin Denison, a Samsung senior vice president during an interview. But he also predicted that the advent of foldable screens will unleash new uses for mobile devices. "It's a technological marvel," Denison said. "The first time you see a flexible screen, it sort of bends your mind." But those improvements aren't a big leap from the smartphones released during the past few years by Samsung, Apple and other top manufacturers. "These phones are all variations on a theme we have already seen," Llamas said. "It's the same song with a slightly different verse." Samsung is offering a slightly smaller S10 model for $750 in an attempt to make smartphones more affordable, but the higher-end models sell for $900 and $1,000. It's the second time in the past five months that a leading smartphone maker has positioned a $750 phone as a frugal option. Apple also priced its cheapest new phone, the iPhone XR, released last fall at $750. Other smartphone makers gaining market share, including China's Huawei and Xiaomi, make smartphones that sell for $500 or less, as well as high-end models. Two of Samsung's new models, the S10 and the S10 Plus, are largely incremental upgrades of last year's S9 and S9 Plus, although they are designed differently. They are about the same size as last year's models, but will have more display space, as Samsung found additional ways to eliminate waste around the edges. As a byproduct, the top right of the display has a circle or oval cut out for the front-facing cameras. The lowest-priced "essentials" model, the S10e, has most of the same features, but is 5 percent smaller than the S10 in volume. The S10e also lacks curved edges, a signature feature for many Samsung phones. Samsung trumpeted its 10th anniversary lineup ahead of a major mobile device conference in Barcelona next week. Huawei, which is threatening to overtake Apple as the world's second biggest seller of smartphones, has promised to use the Spain showcase to preview its own device with a foldable screen and the ability to connect to 5G networks as they become operational during the next few years.